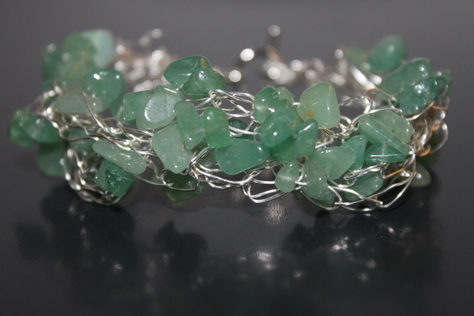 This magnificent Green Aventurine Natural Chips Bracelet showcases the Semi-Precious chips glittering across a silver wire band braided with a non-tarnish silver wire and finished on each end with a silvertone toggle clasp.design with fantastic results. Perfect for those times when you want to make a dreamy and sentimental statement. All pieces are designed by hand, therefore no two items are identical. That's the beauty of buying handmade. The length is 8 inches. The condition is new. Green Aventurine comforts, harmonizes, protects the heart, and is said it can help attract love later in life. It is one of the premier stones to attract luck, abundance and success. Green Aventurine has a particularly soothing energy behind it, and is recommended for working through unresolved emotional issues.